An emotional Sergio Conceicão was not interested in discussing his side’s impressive 3-1 victory over Benfica in the League Cup in detail, instead wanting to focus on “fantastic kid” Emiliano Sala. Sala, it was discovered this morning, was one of two people who were on a flight from Nantes to Cardiff that went missing en route over the Channel Islands, with the 28-year old striker travelling to Wales to complete his highly-anticipated move to Premier League side Cardiff City. The plane has not yet been found, with “no trace” of the small aircraft yet determined. 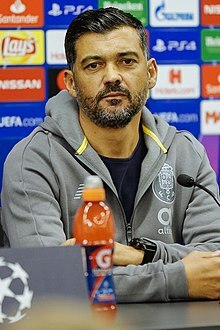 Conceicão, it can be recalled, was manager of Emiliano Sala during his time at Nantes in the 2016-17 season. The Argentinian striker played 34 Ligue 1 games under the current Porto coach, scoring 12 goals in the process as they both worked together to help Nantes to an impressive 7th place finish. Author of picture: Елена Рыбакова.